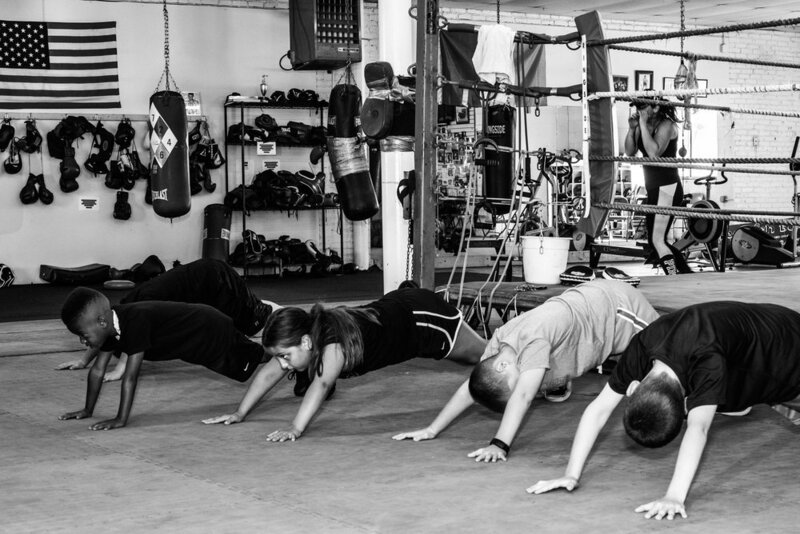 Grealish Boxing Club and Fitness not only trains amatuer and professional boxers for competitions, we also provide classes that focus on women's fitness and teaching children the fundamentals of boxing. Two members of Grealish Boxing Club working out. Not only do you have fun in our women's classes, but you learn self defense and get in the best shape of your life. Our classes are instructed by USA Boxing certified trainers and have years of boxing experience. Our classes are designed to burn at least 600 calories in 60 minutes. Women's Boxing Class Trainer: Jess Perry Lang. For non members $12.00 a class. Youth Boxing Class working their core, doing the plank. Our youth classes are for ages 7-14, both girls and boys. We hold a one hour class that is designed to teach kids the fundamentals of boxing, get them fit, and teach them self discipline and self esteem. Our classes are instructed by USA Boxing certified trainers and have years of boxing experience. Trainers: Gerry Grealish: Former Amateur and Professional Boxer and Nicola Grealish Former Amauter Boxer. * Sibling rates are available. Last class will be held on Saturday, July 28th!